Influenza viruses infect our cells, but cell entry alone does not result in influenza (the disease). where the virus is introduced. Virus may enter via the cell eyes, throat, nose, lungs etc. We incubate Flu virus for about 2 days after infection. Virus usually reaches peak levels within 3 days after infection, reaching slightly higher levels in children than adults, and stopping after about a week. Shedding of Flu virus can last as long as 3 weeks, but more commonly stops within a week after signs and symptoms start. [1,23] Shedding can last longer in very sick infants. The next person we infect in the transmission chain can begin to show symptoms at around 2 to 4 days. For the SARS coronavirus, this range was 8 to 10 days. So we quickly reach peak virus levels and become infectious. These numbers all come as part of a range – higher or lower, longer or shorter all being possible. In those with mild or no symptoms, peak Flu virus levels are generally lower than in those who have clear signs and symptoms. 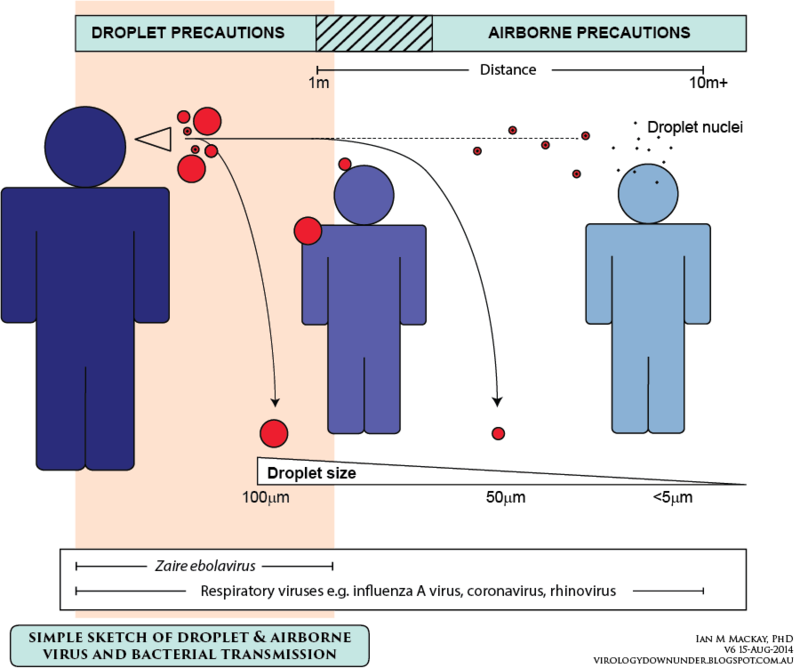 Flu viruses transmit via propelled droplets (≥5μm), aerosols  or after contact with infected people or contaminated surfaces and objects onto which virus-laden droplets have settled. It may amaze some to learn that 1 of every 3 adults have been observed to nose-pick or eye-rub each hour. AN not just once per hour. Another study found that people touched surfaces and their mouth/nose 3 to 4 times per hour! That’s how those surfaces come into play; our fingertips become contaminated and then we inoculate ourselves with Flu virus. Hand washing is really important but that’s a lot of touches. Holding off on touching our faces until after we can wash our hands is a good habit to develop. As well as the virus itself, environmental conditions impact on how long Flu virus can remain infectious on surfaces and in these droplets and droplet nuclei. [12,13] Flu viruses can also remain infectious on nonporous surfaces for some time in general. We come into contact with these kinds of materials many times each day. [2,3] Unless we live on an island near a Jedi temple. Occasionally influenza infects without us showing any signs or feeling any symptoms of having become a virus taxi. Among these outcomes – called subclinical or asymptomatic – if we looked hard enough we might sometimes find a small temperature rise, or a bit of a sniffle or tickly throat that we shuck off as nothing. But we seldom think about that. We can also get mild common cold-like illness from a Flu virus infection. We certainly wouldn’t go to a Doctor for these but we would go to school, work, parties and shopping. Studies using ferrets – a small animal model that can be infected using human Flu viruses and show relevant illness – identified that the amount of virus in the nose correlated with transmission of Flu virus from infected to uninfected ferrets. Obvious signs of ferret sickness were not necessary. Droplets from symptomatic ferrets late in the disease course did not result in infection of sentinel uninfected ferrets but direct contact usually did (as it did in the early stages too). Flu viruses may also transmit during the “presymptomatic” period. This is the time between when we’ve been infected and virus is replicating in our airways but the we’re not yet showing signs of the illness to come. Presymptomatic ferrets could produce infectious droplets (and aerosols?). And direct contact (which is pretty direct among ferrets) was a transmission risk before and during symptoms. Another reminder to wash those hands (or paws, if you’re a ferret)! One study found that neither contact tracing nor isolation of infected people would likely prevent an epidemic. Asymptomatic/presymptomatic spread of infection is a good reason for this. But hang on a tick. How can Flu virus be transmitted from a person or an animal if they are infected but not coughing or sneezing out droplets and aerosols and contaminating surfaces? Viruses were not able to be grown in culture, or culture was not used in these studies and this is a limitation because we can’t say with certainty that viruses were breathed out during such studies could infect a susceptible person; we don’t know if the positive results mean infectious virus was present. ASIDE: PCR methods are used to detect viral RNA. These may be too sensitive to define the period during which a person is infectious, as was found in a study that used ferrets. Flu virus RNA, parainfluenza virus-3 RNA or rhinovirus RNA has been detected from infected ill subjects breathing only through their noses or their mouths, and/or while talking or coughing. [8,9] Rhinovirus RNA was also collected from the breath of 3 talking or just breathing infected but asymptomatic subjects. In a study of 2 ill subjects, infectious rhinovirus was produced as shown by virus replicating in laboratory cell cultures from samples of exhaled nasal breath and coughing breath. Flu isn’t the only respiratory virus that may spread via hot air. So how big is the risk of transmitting virus by breathing? These findings confirm that infectious virus can be produced from breathing alone, but that only a fraction of those infected seem to do this. But let’s not sideline this route too much. The most infectious 20% of children and adults in one study, were responsible for 80% of infectiousness (infectious = amount of Flu virus RNA being shed). Even when only a few infected asymptomatic people shed infectious Flu virus, each of those few may infect several or more others. ASIDE: All of this work is heavily impacted upon by biological variability. These results apply using these particular methods, those scientists, that subject group, their experimental conditions and those Flu virus strains. Interesting hybrid detection methods can help address the RNA vs. virus detection issue, improving the sensitivity of detecting infectious virus. Such techniques can be useful to smooth out some of the differences between studies and to improve upon past studies that only detected RNA. A final topic on Flu virus transmission; distance. Flu virus RNA has been detected in air collected 1.828m (6 feet) away from ill patients. The authors proposed that there may have been enough infectious virus in that air to cause an infection. Research from 2014 showed bacteria-laden cough aerosols could travel 4m (13 feet!) and retain bacterial infectivity. Also, aerosols can hang around (literally) until they impact with something. I’d wager that viruses could manage a similar feat. Air management including of humidity, filtration, flow rate and pressure differences are important protections against spread of infection within healthcare settings. Appropriate personal protective equipment is also important to reduce exhaled or expelled droplets and protect from those expelled by other infected people. This is known. Droplets and droplet nuclei add to what is clearly a complex Flu equation. Aerosols play an important part in the transmission of Flu viruses. Virus can be recovered from asymptomatic folks and breathing and talking are the likely ways transmission occurs before anyone around us knows we are sick. Given that we keep on shedding virus for days after we’re infected, it’s no surprise that office-workers who take just 1 or 2 days off may feel well enough to once again face the workload, but they are probably infecting their co-workers and helping to keep the Flu season alive. Flu viruses and the Flu thank you for your tireless efforts. They thank you less if you got a vaccine which may have reduced the likelihood that a virus gains a foothold in your system or if it does, perhaps reduced the amount of virus you shed, the length of time you shed it or how sick you get at all. Next → Next post: Aussie Flu, UK Flu – who cares? Get vaccinated.